Various mushrooms have been used in folk medicine for the treatment of lifestyle diseases in eastern countries, and several compounds that modulate the immune system, lower blood lipid levels, and inhibit tumor and viral action have been isolated. The fruiting body of Panellus serotinus (Mukitake) is recognized in Japan as one of the most delicious edible mushrooms, and previous studies have demonstrated that the dietary intake of powdered whole Mukitake or Mukitake extracts prevents the development of non-alcoholic fatty liver disease (NAFLD) in leptin-resistant db/db mice. In the present study, we evaluated the effect of the Mukitake diet on the pathogenesis of metabolic disorders in leptin-deficient ob/ob mice. After 4 weeks of feeding, hepatomegaly, hepatic lipid accumulation, and elevated hepatic injury markers in the serum were markedly alleviated in Mukitake-fed ob/ob mice compared with control mice. Moreover, the mild hyperlipidemia in control ob/ob mice was attenuated and the elevated atherogenic index was reduced in Mukitake-fed ob/ob mice. These effects were partly attributable to the suppression of hepatic lipogenic enzyme activity due to the Mukitake diet. The current results showed that Mukitake supplementation is beneficial for the alleviation of NAFLD and dyslipidemia in obese, diabetic ob/ob mice. Diet contributes to the development and prevention of lifestyle-related diseases, and various mushrooms have been used in folk medicine for the treatment of lifestyle-related diseases in eastern countries[1–3]. Several lines of evidence support the nutraceutical effect of edible mushrooms, and many compounds that modulate the immune system, lower blood lipid levels, and inhibit tumors and viral action have been isolated from various mushrooms, such as Shiitake and Hatakeshimeji[1–6]. Panellus serotinus belongs to the same family of mycelia as Lentinus edodes (Shiitake) and Lyophyllum decastes (Hatakeshimeji), and its fruiting body (Mukitake) is recognized in Japan as one of the most delicious edible mushrooms. The technology for the artificial cultivation of Mukitake in plastic greenhouses has recently been developed and has enabled the constant provision of Mukitake mushrooms in the market. Metabolic syndrome, which comprises a cluster of metabolic abnormalities, such as hyperlipidemia, diabetes mellitus, and hypertension, is a widespread and increasingly prevalent disease in industrialized countries and contributes to the increase in cardiovascular morbidity and mortality[8, 9]. Nonalcoholic fatty liver disease (NAFLD) is often associated with features of metabolic syndrome and is emerging as the most common liver disease worldwide[10–13]. Dyslipidemia is a lipid abnormality in the blood, and hyperlipidemia is prevalent due to westernized diets and the disadvantages of modern lifestyles. Insulin resistance can also lead to dyslipidemia. Many studies evaluating the effects of functional food components on the pathogenesis of obesity-related metabolic disorders have been carried out in genetic leptin-resistant db/db mice and leptin-deficient ob/ob mice[14, 15]. db/db mice have a missense mutation in the leptin receptor gene, and ob/ob mice have an inherited deficiency of the leptin gene, and they suffer from hyperphagia and develop a syndrome with multiple metabolic and hormonal disorders, including NAFLD and dyslipidemia, which shares many features with human metabolic syndrome. A recent study suggested that pathological features of liver lesions and the response to diets are slightly different between db/db and ob/ob mice. In previous studies, we demonstrated that the dietary intake of powdered whole Mukitake or Mukitake extracts prevented the development of NAFLD, partly through the suppression of hepatic lipogenesis and normalized adipocytokine profiles, in leptin-resistant db/db mice[17, 18]. In the present study, we evaluated the effect of the Mukitake diet on the pathogenesis of metabolic disorders in leptin-deficient ob/ob mice. All aspects of the experiment were conducted according to the guidelines provided by the ethical committee for experimental animal care at Saga University. Five-week-old male C57BL/6J mice and ob/ob mice were purchased from Japan SLC (Shizuoka, Japan). The mice were individually housed in plastic cages in a temperature-controlled room (24°C) under a 12-h light/dark cycle. The basal semisynthetic diets were prepared according to recommendations of the AIN-76 (Table 1). Mukitake mushrooms were provided by the Forestry Research Institute of the Saga Prefecture, and general components of the samples were routinely determined according to official AOAC methods. The ob/ob mice were assigned into two groups (six mice each) that were fed one of two diets (Table 1): a semisynthetic AIN-76 diet (Control group) or a semisynthetic AIN-76 diet supplemented with 10% air-dried Mukitake powder instead of casein, corn starch, and cellulose (Mukitake group). C57BL/6J mice (n = 6), the progenitors of the ob/ob mice, were fed the same diet as the ob/ob mice in the Control group (Normal group). The mice received the diets ad libitum using Rodent CAFE (KBT Oriental Co. Ltd., Saga, Japan) for 4 weeks. At the end of the feeding period, the mice were sacrificed by exsanguination from the heart under pentobarbital sodium salt anesthesia after a 9-h starvation period. Abdominal white adipose tissue and livers were excised immediately, and the serum was separated from the blood. * Carbohydrate: 62.5%, Fiber: 19.2%, Protein: 12.5%, Ash: 3.8%, Fat: 1.9%. Serum lipoproteins were analyzed using an on-line dual enzymatic method for the simultaneous quantification of triglyceride and cholesterol using high-performance liquid chromatography at Skylight Biotech Inc. (Akita Japan), as described elsewhere. The activities of aspartate aminotransferase (AST) and alanine aminotransferase (ALT) in the serum were measured using commercial enzyme assay kits (Wako Pure Chemicals, Tokyo, Japan). Serum adiponectin and insulin levels were measured using commercial mouse ELISA kits (Otsuka Pharmaceutical Co. Ltd., Tokyo, Japan; Shibayagi Co. Ltd., Gunma, Japan, respectively). Liver lipids were extracted, and the concentrations of triglyceride and cholesterol were measured as described previously[21, 22]. The preparation of hepatic subcellular fractions was described previously. The enzyme activities of fatty acid synthase (FAS), glucose 6-phosphate dehydrogenase (G6PDH), and malic enzyme in the cytosomal fraction, carnitine palmitoyltransferase (CPT) in the mitochondrial fraction, and phosphatidate phosphohydrolase (PAP) in the microsomal fraction were determined as described elsewhere. All values are expressed as the means ± standard error. The data were analyzed using a one-way ANOVA, and all differences were analyzed using the Tukey-Kramer post-hoc test (KaleidaGraph; Synergy Software, Reading, PA, USA). Differences were considered to be significant at p < 0.05. The food intake (Normal, 76.8 ± 2.8; Control, 129 ± 5 g, p < 0.05) and final body weight (Normal, 24.6 ± 0.5; Control, 41.2 ± 0.7 g, p < 0.05) were significantly higher in the control diet-fed ob/ob mice than the C57BL/6J mice after the 4-week feeding period. After being fed the control diets for 4 weeks, the ob/ob mice developed marked abdominal obesity (Normal, 5.97 ± 0.22; Control, 22.3 ± 0.5 g/100 g bw, p < 0.05) and hepatomegaly (Normal, 3.78 ± 0.09; Control, 10.7 ± 0.3 g/100 g bw, p < 0.05). Although the two groups of ob/ob mice did not differ in initial body weight (Control, 35.4 ± 1.1; Mukitake, 35.5 ± 0.8 g) or food intake (Control, 129 ± 5; Mukitake, 129 ± 3 g), the liver weight was 21% lower in Mukitake-fed ob/ob mice (Control, 10.7 ± 0.3; Mukitake, 8.42 ± 0.18 g/100 g bw, p < 0.05). The reduction was associated with decreased triglyceride (32%) and cholesterol (31%) accumulation in the liver (Figure 1). The effects of dietary Mukitake on hepatic injury marker levels were also evaluated, and the activity of ALT tended to decrease (by 26%) and AST activity was markedly decreased (by 32%, p < 0.05) in the serum of Mukitake-fed ob/ob mice compared to control-fed ob/ob mice (Figure 2). Consistent with previous reports that indicated the alleviation of hepatomegaly and hepatic steatosis in Mukitake-fed db/db mice[17, 18], dietary Mukitake also protected ob/ob mice from the development of NAFLD. Hepatic lipid levels in C57BL/6J and ob / ob mice. Mice were fed the control diet or Mukitake diet for 4 weeks. Values are expressed as the mean ± standard error for six mice. See Table 1 for the composition of diets. abc Different superscripted letters indicate a significant difference at P < 0.05. 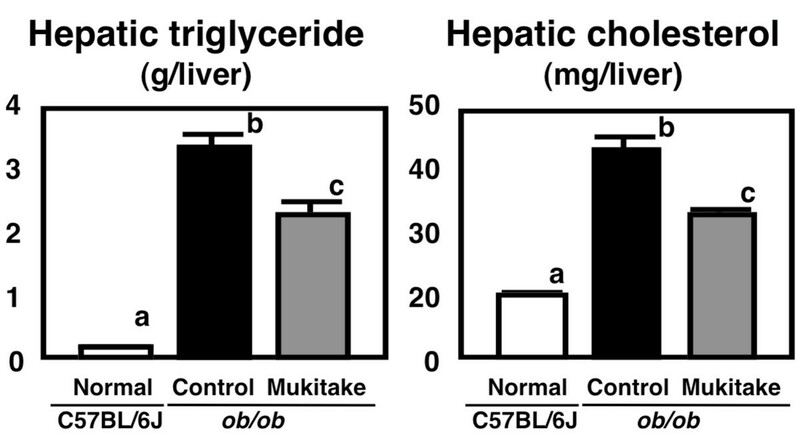 Hepatic injury marker activities in C57BL/6J and ob / ob mice. Mice were fed the control diet or Mukitake diet for 4 weeks. Values are expressed as the mean ± standard error for six mice. See Table 1 for the composition of diets. abc Different superscripted letters indicate a significant difference at P < 0.05. After the 4-week feeding period, ob/ob mice fed the control diet had mild hyperlipidemia (Table 2). The serum triglyceride level was 1.3-fold higher and the serum cholesterol level was 2.7-fold higher in control-fed ob/ob mice than C57BL/6J mice. The Mukitake diet markedly lowered the triglyceride and cholesterol concentrations in the serum of ob/ob mice (Table 2). Additionally, Table 2 shows the serum lipoprotein profiles in C57BL/6J mice and ob/ob mice. Triglyceride levels in the chylomicron (CM) and very-low-density lipoprotein (VLDL) fractions tended to decrease (by 53% and 33%, respectively) and levels in the low-density lipoprotein (LDL) and high-density lipoprotein (HDL) fractions were decreased (by 45% and 34%, respectively) in the Mukitake group compared with the Control group in ob/ob mice. The cholesterol levels in all fractions were decreased in Mukitake-fed ob/ob mice. Moreover, the calculated atherogenic index (cholesterol ratio of [VLDL + LDL]/HDL) was significantly lower (by 41%) in Mukitake-fed ob/ob mice compared with control-fed ob/ob mice. These results suggest that dietary Mukitake can alleviate dyslipidemia in obese, diabetic ob/ob mice and has an anti-atherogenic property. Values are expressed as the mean ± standard error for six mice. abc Different superscripted letters indicate a significant difference at P < 0.05. CM; chylomicron, VLDL; very-low-density lipoprotein, LDL; low-density lipoprotein, HDL; high-density lipoprotein. Insulin resistance, as well as compensatory hyperinsulinemia, are the essential first pathologic step in the development of NAFLD and dyslipidemia[25–27]. In fact, hepatic steatosis and hyperlipidemia have been proposed to be a feature of insulin resistance syndrome along with type 2 diabetes and visceral obesity[25–27]. Adiponectin is one of the most abundant secretory proteins produced by adipose tissue in rodents and humans and is suggested to play a protective role in insulin resistance. In obese, diabetic ob/ob mice (Control group), serum insulin levels were markedly increased and serum adiponectin levels were significantly decreased compared with the C57BL/6J mice (Normal group) (Table 2). Our previous study indicated that powdered whole Mukitake and Mukitake extracts tended to alleviate hyperinsulinemia through increasing serum adiponectin levels in db/db mice[17, 18]. In the present study, however, the Mukitake diet did not affect serum adiponectin levels or improve hyperinsulinemia in ob/ob mice. The results suggest that the alleviating effect of the Mukitake diet on the pathogenesis of NAFLD and dyslipidemia appears to be independent of the adiponectin level and hyperinsulinemia in ob/ob mice. The liver is the pivotal organ with regard to lipid metabolism; thus, its metabolic disruption induces lipid abnormality in the entire body. To further examine the effect of the Mukitake diet on the liver, the activities of hepatic enzymes related to triglyceride metabolism were analyzed (Figure 3). 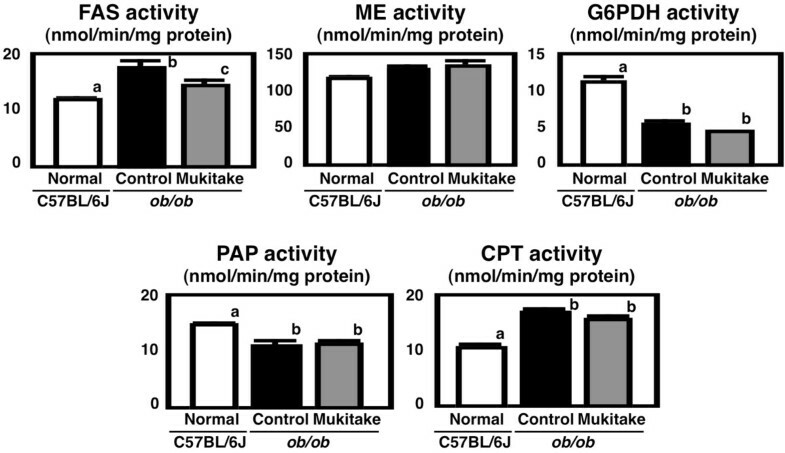 The activities of malic enzyme and G6PDH, enzymes related to lipogenesis, the activity of PAP, a key enzyme in triglyceride synthesis, and the activity of CPT, a key enzyme in fatty acid β-oxidation, were not altered by the Mukitake diet in ob/ob mice. On the other hand, the activity of FAS, a key enzyme in de novo fatty acid synthesis, was significantly elevated (by 50%) in control diet-fed ob/ob mice compared with the C57BL/6J mice and reduced (by 18%) in Mukitake-fed ob/ob mice compared with control diet-fed ob/ob mice. In agreement with the present results, previous reports showed that dietary intake of powdered whole Mukitake or both water extracts and ethanol-extracts from Mukitake prevented the development of NAFLD with the suppression of hepatic FAS activities in db/db mice[17, 18]. Because differential analysis between Mukitake and Shiitake, mycelia from the same family, using liquid chromatography time-of –flight MS technology revealed that there are several compounds only exist in Mukitke extracts, further structural identification and evaluation of physiological properties (especially, suppressive effects on FAS activity) of the compounds would be necessary in future study. Additionally, given the fact that hepatic lipid abnormalities initiate a progression of liver damage and a sequence of lipoprotein changes[29, 30], we suppose that the alleviation of NAFLD and dyslipidemia by the Mukitake diet was partially attributable to the suppression of de nove fatty acid synthesis in the liver. Activities of hepatic enzymes related to triglyceride metabolism in C57BL/6J and ob / ob mice. Mice were fed the control diet or Mukitake diet for 4 weeks. Values are expressed as the mean ± standard error for six mice. See Table 1 for the composition of diets. abc Different superscripted letters indicate a significant difference at P < 0.05. In conclusion, our present study showed that Mukitake supplementaion is beneficial for the inhibition of NAFLD development in leptin-deficient ob/ob mice besides in leptin-resistant db/db mice. Moreover, this is the first study showing that Mukitake has beneficial effects in attenuating possible atherosclerotic processes by reducing the atherogenic index in the serum. We thank Takanori Morooka and Saori Nomura for their technical assistance and Naoki Nagamori for providing Mukitake samples. This work was supported by a research grant from the Japanese Ministry of Education, Culture, Sports, Science and Technology. NI and KN made substantial contributions to the conception and design of the study, performing the experiment, assembling, analyzing and interpreting the data and drafting the manuscript. MI and BS participated in the experimental work and in collecting, assembling, and analyzing the data. TY contributed to planning the experiment and discussing the results. All authors read and approved the final manuscript.